Well, here we go again folks. As if it weren't enough that I knocked myself out in April participating in 30 Days of Photos, now dear Nicky and Mike over at We Work For Cheese have corralled a bunch of us suckers into a 30 Days of Writing exercise. Yeah, I know. I must have stupid written backwards on my forehead. I don't know how they figured it out. They would have had to look in my mirror to realize it. Anyhoo, the first day's theme is - surprise, surprise - cheese. And here are the internet imbeciles Nicky and Mike managed to sucker into to this little exercise: Well, first off there's me! Once you've read my post you can visit: Mike and Nicky, Cheryl, If I Were God, Katherine, Laughing Mom, Linda M, Malisa, MikeWJ, Sandra, Leeuna and Still Unfinished. Okay, who cut the cheese? Well growing up in my house it was usually my mother. She prepared and served the food and the knife was too big and sharp for us kids. What did you think I meant? Back in the day, though, our cheese usually consisted of cheddar. Or parmesan to go with our spaghetti. We had spaghetti a lot. We also had tuna casserole a lot. Kraft Dinner (or Mac and Cheese for you Americans). With tuna. With cheddar. And with peas. My mother's idea. I've not eaten a pea since. Although I do still like cheddar. But I'm not a big Kraft Dinner fan. As I've aged, though, (pun intended) I've come to like many other kinds of cheese. I love the balminess of brie, the souciance of swiss, the perkiness of provolone, the cheekiness of cheddar, the frankness of feta, the heartiness of havarti... well, you get the idea. I pretty much like all kinds of cheese, save the bitterness of blue cheese. We'll just file that stuff with those peas I think. Yep. Otherwise it's all gouda. No way, I hear you say. I'm not sure how I developed this love affair with cheese. But there's nothing I love more than sitting around with a couple of good friends, enjoying a glass or two of wine or a beer and an assorted plate of cheeses and pates with some nice crackers and baguettes. I think it's the French influence of the love of my mid-life, Mrs. D. She's introduced me to a whole other world of cultured gourmet living. It's really quite a change to my approach to fine cuisine in the past. I'm far more refined and elegant than I ever was. I no longer eat Cheez Whiz, for instance. And Cheezies are so, well, cheesy. No more licking orange dust off my fingers when I have a little snack. I mean no longer would I ever say, "Hey, hands off of those. They're Nachos, they're mine." So I got points for Cheez Whiz and Cheezies? Cool. I'm with you on the peas. I can't and won't eat them. Blech. But I love Mac and Cheese. Oh how I love it. I would take a bath in it, if I had the chance. I'm all over the 30 day writing challenge, too. Though it's only one day so far, so I guess I shouldn't get too excited. I do NOT like cheese, but I do like your punny writing, dufus, even when you're talking about cutting the cheese. Didn't we all used to eat Kraft Mac & Cheese at one time or another. Not so much growing up, as in the early adult years before I discovered the real thing, and then learned to make it. I have always loved cheese, any which way, but never on a burger (mac & Cheese). I really dislike cheese on my burger. A bath in Mac and Cheese? Wow, I'll bet your noodle loves that! I save havarti for cutting the cheese. Heh, heh, heh. I ate Mac and Cheese as a kid and then as a university student. Couldn't afford much else other than bologna sandwiches. Oh, I love cheese burgers. It just seems to add to the flavour and taste especially on the BBQ. You know, I couldn't agree more. I could live like that too. Seems like all the proper food groups, Linda. hear hear! And here, as in right here. The cheeseburger that is. When it comes to cheese, you don't need to convince me. 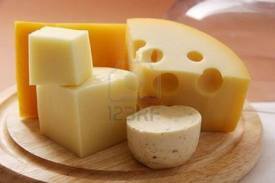 Here's to all of your cheesy puns!! I didn't grow up eating much cheese - even Mac and Cheese wasn't a staple in my house. I did have to suffer through a few grilled cheese sandwiches when my mother had forgotten to take the cheese out of it's wrapper. You have cheese and a French wife?! That's so hawt, NoName! I know I'm not in charge of this contest, but I'm awarding you 1,000 points for using the word "souciance," even though I'm not convinced you used it correctly. I love cheeseburgers. No burger should be eaten without cheese, in fact. Oh, I know. You're the expert. The big cheese, as it were. Ha, ha, ha, that conjures up quite a vision. Oh, that's a good one. Wow 1000 points for a word that doesn't exist. Thanks, Mike. I should have said "insouciance" or maybe I should have avoided this word altogether and just said care-freeness. Does that work? Kinda screws up my alliteration. Mmm. What about cream cheese? Does that count? heh heh My fave: softened cream cheese on a ritz cracker AND.... a generous dollop of jalapeno jelly. Sounds a lot like my childhood. Crackle Barrel cheddar was the only cheese I knew about until way into adulthood and learned about yellow dye and other nasty stuff. I'm glad you've found someone to broaden your palette. Steinberg's used to sell these fat squeezable tubes of cheese . They looked like cheez whiz but came in different flavours. Good one UP. Really good one. Wish I'd thought of it. You gotta love those boxes of wine with the tin foil sack that you can squeeze to get the last drop out of. I mean classy or what. Oh, yeah, there was a time when Velveeta was thee cheese for connoisseurs. With me it was a brick of cheddar. Yeah, I left a comment, I think on Linda's blog today, about growing up with those squeezable cheeses. I used to love that stuff. But who really knows how much of it was actually cheese. You know when I was doing the groceries yesterday I passed by Cheezies and it was all I could do to hold myself back. I so wanted to buy a bag. But I was good. And my fingers today are thanking me. Kraft Dinner is a little bland and flavorless for my tastes. I like something sharper and, well, "cheesier". I absolutely love Vermont White Cheddar. And any cheese involving hot peppers. I also hereby admit that at the age of 42, I still love Cheez Whiz. Just stay away from Casu Marzu, okay? P.S. I like peas. Can we still be friends? I gotta say, parmesan onto of spaghetti = amazeballs. Never had Casu Marzu. I take it you like it a lot. Cheetos and Cheezies are two different snacks. If you like hot peppers you might like spicy havarti. And I know you like cheese cure you keep coming back to my blog. *hisses and holds up the index fingers in his two hands in the sign of the cross* But, yeah, okay. A block of parmesan freshly shredded on spaghetti is absolutely delicious. Sometime I miss Cheez Whiz. Oh, and Meleah, thanks for dropping back to catch up on commenting on this series. You're a great follower. I'm running around like a NUT trying to catch up! Catch up? Don't you mean cashew? OMFG. NO, no, noooo. I wouldn't eat casu marzu even if it was the last thing on Earth. Um.... do me a favor and take a moment and Google "Casu Marzu" for me, would you? I'm sure you'll understand.... and please pardon me as I sit in the corner weeping and retching. See, I trust you despite your pea-hatred. This is because you have a video of Monty Python in your sidebar. That's so awesome it trumps everything else. I try to change that video every week. But this week it just happens t be the wonderful Lumberjack song. Contains live insect larvae? WTF. Oh, you can bet I'll stay away from that! You just have to be patient for DISQUS to pop up. I don't know why it always jumps to Blogger comments just for you. I guess you're just so darn anxious to tell me about Casu Marzu.